Job seekers these days have few advantages when applying for jobs if they don’t have an inside contact to smooth the path. The best recruiters make it easy to connect and make it possible to forge a working relationship with the brand. A recruiters job is to find top talent, yes, but a big part of that job is defending the brand against bad hires – think of Zappos’ practice of buying out employees who don’t “fit” quickly. And they continue to innovate. Zappos’ is currently doing a great job of spotlighting their recruiters. A brand win, win. This means, as with in-the-trenches HR, a large part of their job is risk management. It’s not that they’re against you, candidates; it’s more that they’re for the company and culture first. If you turn out to be the ideal candidate that’s a bonus, but it’s not job #1. 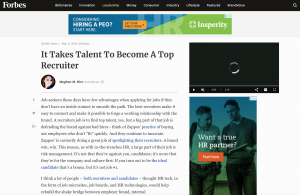 I think a lot of people – both recruiters and candidates – thought HR tech, in the form of job microsites, job boards, and HR technologies, would help rebuild the shaky bridge between employer brand, internal recruiter/external recruiter and the candidate experience. And for some companies it has done the job, principally because the brand awareness is so strong. (TOMS Shoes, Apple AAPL +0.04%, and Google GOOGL +0.6% come to mind.) For these companies, candidates self-select before they enter the recruiting pipeline. This candidate-centric approach requires a very strong brand and equally strong recruiting practices. So I encourage you to add a dose of reality (and fun) by watching the Top Recruiter Miami social show and competition. Executive Producer Chris Lavoie has done a great job borrowing the “top chef” model and applying it to the world of social and recruiting. This year’s event, scheduled for three weeks from now in Miami, will be more than entertaining TV (no Snooki, alas) – it’s a master class in how to be a top recruiter, one who puts the candidate and the brand first.